First, the collard greens are the best we have ever eaten. Very, very fresh. Outstanding. Highest recommendation. And we usually don't like coleslaw, but it was excellent at Dixie Bones. Not too creamy and gloppy like most coleslaw, and again, very fresh. Even if you don't normally eat coleslaw, try it here. The meat on the ribs fell off the bone. The pulled chicken with the vinegar sauce was outstanding. Two sauces are suggested for the chicken: a white sauce that contains mayonaisse and vinegar (we were told by another patron that the white sauce is an acquired taste and very common in Alabama); and a vinegar sauce, which we preferred. The pork shoulder is very, very good. The beef brisket is very, very good (and also excellent the next day). And although we didn't take a picture, the pecan pie is highly recommended. Not too sweet - just right. Highly recommended. Worth the drive. We'll go back. If you are about to graduate from college, there are three financial things you should definitely do once you get your real-world job. First, make sure you sign up for the 401(k) plan or any similar retirement plan if it's available. Second, through payroll deduction, set aside a percentage of your pay in a savings account (not checking) that you will not touch. This will be your emergency money. I suggest 10 percent from every paycheck. And, if you are renting, get renter's insurance. If you went gaga over that "lizard attacks girls wearing meat hats" video a while back, this will be welcome news. BoingBoing reader Gavin Purcell just launched a new blog about odd (at least to Westerners) stuff on television in Japan. [Congresspedia] is the "citizen's encyclopedia on Congress" that anyone can edit. Congresspedia is a collaborative project of the Center for Media and Democracy (http://www.prwatch.org) and the Sunlight Foundation (http://www.sunlightfoundation.com/) and is designed to shine more light on the workings of the U.S. Congress. It is starting with an article on every member of Congress. How About the Boeing Beltway? We tried China Star after reading Tyler Cowen's description, although we tend to eat more Cantonese than Szechuan. Come here if you like spicy food, although they do have less-spicy dishes, too. The scallion chili chicken is excellent. You can order it with bone left in or bone taken out. We recommend bone left in for more flavor, although bone taken out will be a bit easier to eat. 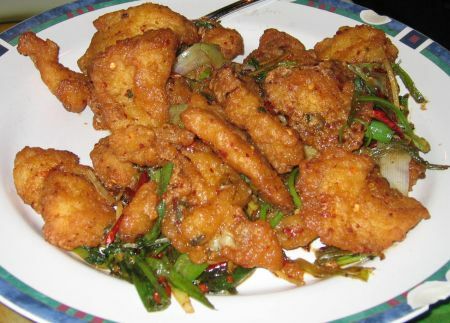 The scallion fried fish is also excellent. 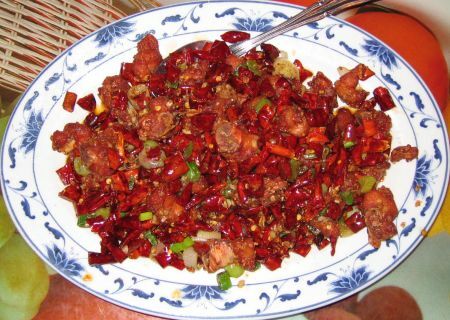 Although the spicy chicken may look hotter, the fried fish was the spicy dish. Whenever we go to a new Szechuan restaurant, we always order the ma pao tofu. 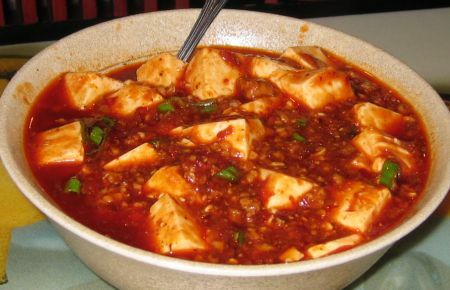 The standard against which we judge ma pao tofu is that served at Wu Liang Ye in NYC. While this dish is very good at China Star, it is not as good as the ma pao tofu at Wu Liang Ye. Final note: the staff at China Star are among the friendliest we have ever encountered at a Chinese restaurant, anywhere. We haven't published a TWIR lately as we've been working on putting Tyler Cowen's Ethnic Dining Guide in blog format. [Vinod Khosla, who helped found Sun Microsystems] is particularly enthused by “cellulosic” ethanol, a highly efficient way of making fuel from agricultural waste. President Bush touted this new technology in his recent state-of-the-union speech, suggesting that it may come to market in six years. In typically impatient form, Mr Khosla wants to halve that gestation period. Mr Khosla is convinced that “this fuel is greener, cheaper, more secure than gasoline--and this shift won't cost the consumer, automakers or the government anything.” There are undoubted attractions to ethanol. But making the switch will surely not be as easy or cheap as he suggests. Retail distribution is one obvious problem: fewer than a thousand petrol stations in America sell the most desirable blend of ethanol fuel today. Expanding infrastructure will cost money and take time, and the oil industry is not exactly enthusiastic. And cellulosic technology, which seems so promising today, may take much longer than expected to achieve commercial scale, or might fail altogether. Strange though it seems, a typical microwave oven consumes more electricity powering its digital clock than it does heating food. For while heating food requires more than 100 times as much power as running the clock, most microwave ovens stand idle—in “standby” mode—more than 99% of the time. And they are not alone: many other devices, such as televisions, DVD players, stereos and computers also spend much of their lives in standby mode, collectively consuming a huge amount of energy. Moves are being made around the world to reduce this unnecessary power consumption, called “standby power”. The Americans for Prosperity Foundation Ending Earmarks Express has hit the road! Follow Americans for Prosperity Foundation as we tour the country visiting the sites that have received the most egregious wastes of taxpayer dollars and fight to end the process of attaching hidden earmarks to legislation by our elected officials. [Alan Mollohan's] seniority on the Appropriations and ethics cmtes raises larger and fundamental questions about the use and abuse of earmarks. We are witnessing the last growl of the unbridled power of the press. Some in the press would like to think -- but would not be stupid enough to brag -- that they could "destroy people" for a living. And though they certainly can cause headaches for people in the spotlight, the odds of fatality go down by the day as there are more and more means of response. Now the targets can turn the tables on the journalists. I’ve seen reporters go ballistic when their emails to sources or transcripts of their interviews are published on blogs. Well, tough. What’s good for the goose is now grist for the gander. I don’t know about you, but I’ve been feeling sorry for Volkswagen for a while now. VW didn’t so much lose their mojo as strap it to the nose of a Titan IVB and fire it into deep space. No disrespect to the world’s fifth most populous country, but was anyone really surprised when a VW Golf construído en Brazil turned out like bobo de camarao cooked in Lower Saxony? Now that Vee Dub’s got THAT out of their system, here comes the new, Wolfsburg-built Golf GTI. It’s an Old School hot hatch with a Masters in High Tech. Da lata! Bottom line: you can blast the GTI through a bend almost twice as quickly as you’d imagine possible-- at least at first. Once you get used to the GTI’s adhesive tenacity, once you accept the fact that the understeer slide justain’tgonnahappen.com, only the cleanliness of your license, children on board and the stupidity of fellow road users prevent you from endless adrenal indulgence. Although the GTI rides a bit like a proper sports car tied down with rubber bands, it’s comfortable enough to enable a daily fast. The GTI's combination of balls-out fun, affordability and everyday practicality made the original hot hatch a working class hero. In that sense, June’s four-door GTI will be the better-- and better-looking-- bet. And while there’s no question that the new GTI represents a welcome return to form for cash-strapped pistonheads, the jury is out on the reliability part of the practicality equation. If that’s an issue, I strongly recommend that you do NOT test drive the new Golf GTI DSG until AFTER you’ve read Consumer Reports. While many students would be motivated by career-and-college prep, others have no interest in spending more time in the classroom than absolutely necessary. They want the academic skills needed to train for a skilled trade with decent pay. The good news is that if they learn enough to qualify as apprentice plumbers, they'll know enough to take advantage of community college classes. In fact, it takes higher reading, writing and math skills to get into apprenticeships than it does to get into two-year colleges. Plumbers do more than make it easy for you to get a glass of water; they’re lifesavers. Throughout history, millions of people have died due to a lack of clean water. Diseases such as cholera, dysentery, typhus, typhoid fever, and even the plague, were all related to poor sanitation and infected water sources. Thanks to advances in plumbing in the late 1800s, these diseases are now rare in developed countries. The average yearly salary for plumbers in 2004 was $44,510, according to the U.S. Department of Labor. Keep in mind that apprentices start work at half the salary earned by experienced workers. You can expect to receive raises throughout your training though, often every six months. The Texas Alcoholic Beverage Commission has been cracking down hard on bar patrons who are exceedingly drunk. Through sting operations at watering holes around the state, TABC officers are nabbing drinkers who've tossed back a few too many, with the idea that the operation will cut down on drunk driving. Mr. Thomas [of Thomas Pharmaceuticals Ltd.] had his eureka marketing moment after viewing a spate of antacid commercials on TV. He realized the market was vast, but it had a gap: some antacids had fizz, but their presentation lacked pizzazz. "There has to be a consumer in this marketplace who wants something with a little bit of style and substance," he says. Chic relief won't come cheap. A tin of 32 spearmint-flavored Acid+All tablets will cost about $3.89 (more if you buy them in a hotel); by contrast, a 3-roll pack of Rolaids totaling 36 tablets sells for $1.99 at Duane Reade and the same amount of Tums runs $2.39. "There's definitely a market for hip drugs for not-so-hip diseases," Ms. Leigh says. "A lot of manufacturers are repackaging to be hipper. There's so much competition that you need to differentiate." She notes that after Sucrets throat lozenges brought back its old tin packaging, sales of the product rose 50% at Drugstore.com in the fourth quarter of 2005. Rolaids, for one, now has "Softchews," which it sells in gum-like packaging in flavors including Wild Cherry. Who do you think will pay twice as much for a hip antacid rather than Rolaids? Someone with a college degree or a plumber? Well, the Chinese are running out of those 19-year-old females just off the farm and ready to work for nothing. And they’ll continue to run out of them until Beijing’s leaders allow for private land ownership in the countryside, which will lead to realistic land valuation there, push even more people into the cities, and allow the accumulation of the capital necessary to further modernize the agricultural sector. News flash: Girly girls like to play soccer! Whoopi Goldberg thinks her show about a girls' soccer team will break new ground, showing that sports aren't just for boys or tomboys. I think girls' soccer became a staple of American childhood at least 20 years ago. [in Kent Brockman voice] "Next up: Whoopi Goldberg discovers ... girls play tennis!" "TX 22: Storied Career to End When DeLay Leaves Hill"
Tom DeLay’s rise to the pinnacle of influence on Capitol Hill was characterized by iron-fisted control over his House Republican colleagues, and a cozy relationship with lobbyists. The former House majority leader’s slide from that perch, which appeared complete Monday night as word spread that he was abandoning the Texas seat he has held since 1985, began as he and some of his closest associates sank into a quagmire of legal and ethical allegations, many of them related to the associations he built with K Street. And as the whiff of scandal grew stronger, DeLay’s House colleagues, many of whom had respected or feared him not long ago, quickly turned elsewhere for leadership, despite DeLay’s insistence that his troubles were politically motivated attacks orchestrated by Democrats. DeLay’s decision to leave Congress comes after a key former aide, Tony Rudy, pleaded guilty March 31 to a conspiracy charge in the Jack Abramoff lobbying scandal. CQ rates the general election race as No Clear Favorite. Please visit CQPolitics.com’s Election Forecaster for ratings on all races.